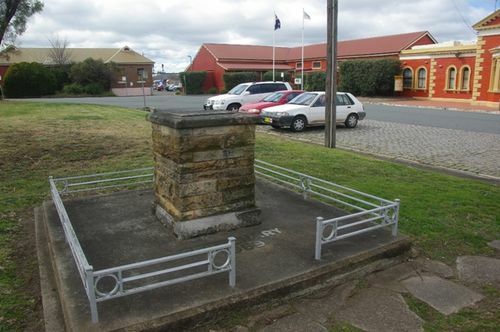 A cairn commemorates the centenary of the Sydney to Goulburn Railway. Following the completion of the first railway from Sydney to Parramatta Junction in 1855, proposals for the first railways to the rest of New South Wales were driven by rural constituents seeking improved transport for primary produce from the inland centres of Goulburn, Bathurst, Singleton and Muswellbrook. Almost a decade later, the single line from Marulan to Goulburn opened on 27 May 1869 . The railway station was also officially opened on 27 May 1869 with the Sydney Morning Herald reporting that the first train between Sydney and Goulburn departed Sydney at five minutes past eight in the morning and arrived in Goulburn at five minutes to four, travelling at a maximum speed of 35mph. It is desired that the container be opened on 24th May 2069. Unveiled by N. McCusker Esq., C.B.E. Commissioner for Railways N.S>W. on 24th May 1969.